Many spa’s are trying to green up their image, but Elaia Spa is just naturally that way. Housed in Hyatt’s Olive 8 building in Downtown Seattle, it is part of Seattle’s first LEED certified hotel. As a part of a green building, certain requirements for water conservation, construction materials and energy savings are already part of the package. You can see these details throughout the Spa, although none of it distracts from the experience, in fact, it does more to enhance it. Elaia Spa features in-season local ‘market fresh’ and organic spa ingredients sourced from the Pacific Northwest, your massage will most likely include organic olive oil from Oregon and organic aromatherapy scents. Local and organic skin care products are also available for purchase at the spa. Indulgent low-flow showers are designed with ample spray coverage, so it feels like a traditional flow head. The all-inclusive spa allows access to separate steam rooms and saunas allow for relaxing privacy. Also included is a full gym facility which is much more robust than you commonly find in hotels and a saltwater lap pool and hot tub. 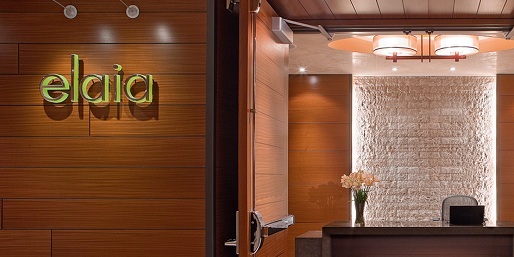 Quite a indulgent eco-friendly experience, this green spa is a welcome addition to the Downtown Seattle spa options. Nice place. It must really be a relaxing place.